The essential taste of Brazil: feijao - black bean casserole. This is the cocktail that you’ll see Brazilians consuming at the beach and often before meals. Made with the ubiquitous Cachaça sugarcane spirit, the caipirinha is equally delicious and refreshing, thanks to generous quantities of fresh lime and brown sugar. The cocktail is famed for “contributing to the happiness and energy” of the South American country’s population. Pão de queijo is a gluten-free cheese bread found pretty much all over Brazil; at cafes, bars and even petrol stations. The essential difference between this and your average bread? The flavour comes from sweet and sour starches from the manioc root (cassava). Pão de queijo is quite literally the eat-anytime option: for breakfast, as a snack or used as dinner rolls. The kids tend to love them too. Cassava-flour-based farofa is popular for its versatility, simplicity and taste. While there are hundreds of recipes for farofa, the dish is basically just toasted cassava flour with your favourite ingredients and spices thrown in; you can make it with eggs, ham, chorizo and/or carrots. It’s typically served as a side dish with beans. Goiabada goes well with cheese, but the versatile flavour of this pink guava paste is most commonly used to accompany Brazilian sweets: biscuits, cakes and desserts. Not only is it delicious, it’s also 100 per cent natural. Pacoquinha (sweet peanut rolls) are a divine choice of snack featuring a crumbly, fall-apart texture that melts in your mouth. Their rich and sweet flavour marries well with coffee and complements ice-cream sublimely. 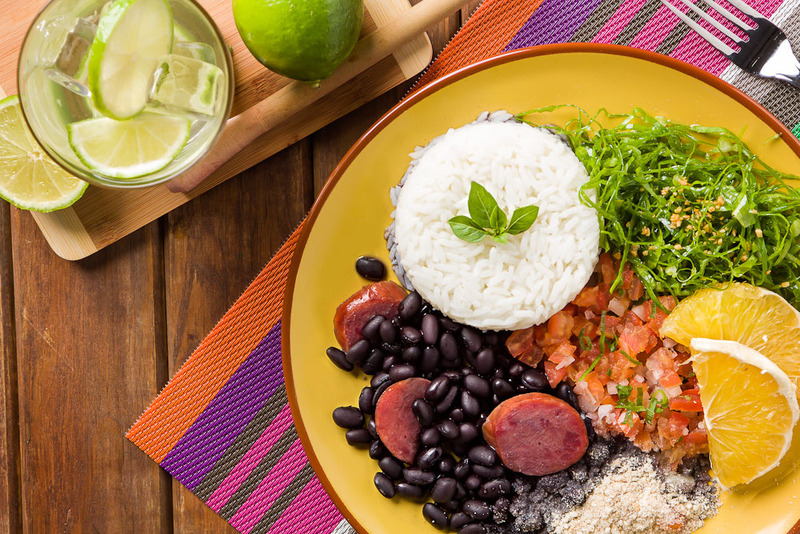 The black bean casserole is basically the country’s national dish, devoured by millions of Brazilians every day. You’ll find the vegetarian feijao on offer for lunch and dinner. The black beans are super nutritious and high in fibre by themselves, but meat has also been known to find its way into the dish too. The South Brazilian-style barbecue secret was out long ago and it’s slowly making its way around the globe. Churrasco is a variety of meats, such as pork, chicken and beef, barbecued over natural wood charcoal, leaving them with the trademark churrasco smokiness. It’s more for a dinner party occasion than an everyday indulgence. The Brazilian biquinho chillies, particularly popular in the east and north of the country, don’t radiate a particularly strong heat, meaning even a person who doesn’t like chillies may enjoy them. They are eaten as a side dish or in salads, their deep red hue adding colour to the table. Manioc chips are an extremely moreish snack, which you’re more than likely to see being devoured en masse on the beach in Rio. The oven-baked chips are made from manioc starch, making them a gluten-free alternative. This much-hyped, antioxidant, fibre and vitamin-rich berry led the superfood revolution in the West, but they are more mainstream in their native Brazil. Brazilians normally eat or drink them as part of a healthy breakfast, in a sorbet or smoothie. In some regions of Brazil, acai is eaten as a savoury dish. Ana Lucia Ferreira is co-founder of Brazilian Style Imports together with Jason Hill, an importer of Brazilian food, beverage and barbecue equipment products in Australia.